Picosure is a fast and painless laser treatment that treats facial pigmentation, unwanted body pigmentations, sun damage, freckles, pigmented lesions, and wrinkles or acne scars, and can be used to treat any area of the body including the chest or décolleté, face, hands, legs, and more. Picosure skin rejuvenation is safe to treat all skin types, and treatments are fast and painless with no downtime. Refresh your skin today with PicoSure’s breakthrough technology and see visibly clearer skin faster, and with fewer treatments. 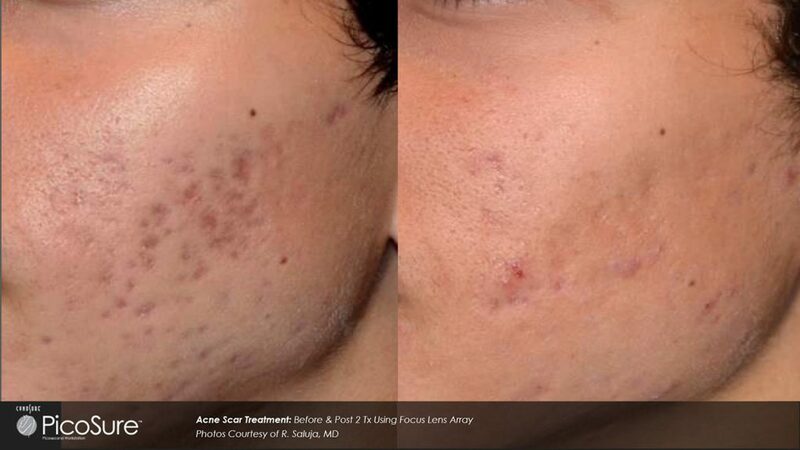 Treating acne scars is easier than you think. PicoSure reduces the look of scars without harming surrounding skin. In just a few fast, easy treatment sessions, scars are much less visible, leaving behind clearer, more attractive skin. Picosure laser works by removing damaged layers of skin. Layer by layer of skin is removed with this treatment. After few treatments your new skin is revealed. The light from the laser stimulates collagen production which rejuvenates the skin and removes skin irregularities itself. PicoSure helps provide your skin with a more youthful appearance by erasing unwanted pigment, age spots and freckles faster than ever before with minimal to no discomfort or downtime. PressureWave technology safely sends laser pulses underneath the surface of the skin to break up dark spots into tiny particles that are eliminated from the body through the circulatory and lymphatic systems. In the next few weeks, pigmented lesions, age spots, birthmarks and dark spots on the face, neck, chest, hands, arms and legs fade away, leaving you with unblemished and revitalized skin. As we age, that support structure within the skin begins to weaken, forming wrinkles. PicoSure uses powerful technology to improve the look of the skin by stimulating collagen and elastin production. PressureWave technology safely sends laser pulses lasting one trillionth of a second, 100 times faster than a nanosecond laser, deep below the surface of the skin to target specific tissues. Unlike surgical face-lifts that require long recovery times, laser treatment offers an effective and convenient alternative without the typical discomfort and downtime.